LOS ARABOS, Cuba, Feb 20 2015 (IPS) - On the blue flame of her biogas stove, it takes half as long for rural doctor Arianna Toledo to heat bath water and cook dinner as it did four years ago, when she still used electric power or firewood. 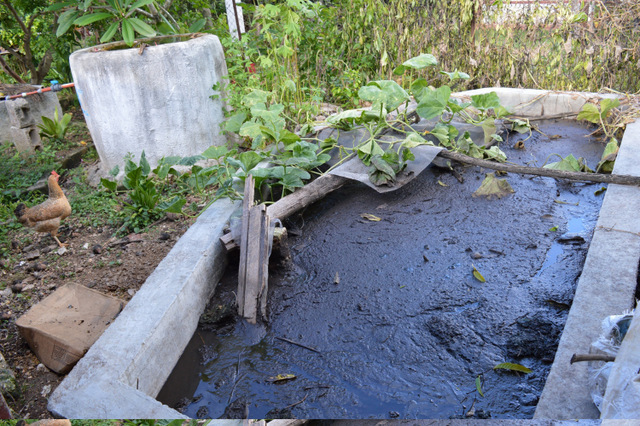 The installation of a biodigester, which uses pig manure to produce biogas for use in cooking food, cut the expenses and the time spent on food preparation for Toledo’s five-member family, who live in the town of Cuatro Esquinas, Los Arabos municipality in the western Cuban province of Matanzas. 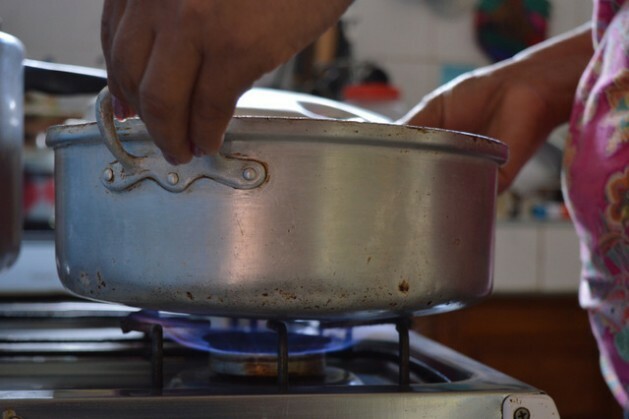 “The main savings is in time, because the gas stove cooks faster,” Toledo told Tierramérica. She and the rest of the women in the family shoulder the burden of the household tasks, as in the great majority of Cuban homes. Another 20 small biogas plants operate in homes in this town located 150 km from Havana, and over 300 more in the entire province of Matanzas, installed with support from a project run by the Christian Centre for Reflection and Dialogue (CCRD-C), based in Cárdenas, a city in the same province. The ecumenical institution seeks to improve living conditions in rural areas by fomenting ecological practices, which mitigate environmental damage, soil degradation and poor use of water. Another key aim of the biodigester project is also to ease the work burden and household expenses of rural women. “Our monthly power bill has been reduced, and we spend less on cooking gas cylinders, while at the same time we’re protecting the environment by using a renewable natural resource,” Toledo said. In Cuba, 69 percent of families depend on electricity for cooking. Toledo’s husband, Carlos Alberto Tamayo, explained to Tierramérica that using the biodigester, the four pigs they raise for family consumption guarantee the fuel needed for their home. “And the organic material left over is used as natural fertiliser for our garden, where we grow fruit and vegetables,” said Tamayo, an Episcopal pastor in Cuatro Esquinas, which has a population of just over 2,300. He said the biodigester prevents bad smells and the spread of disease vectors, while the gas is safer because it is non-toxic and there is a lower risk of accidents or explosions. With the support of international development funds from several countries, for 15 years the CCRD-C has been promoting household use of these systems, reforestation and renewable energies, which are a priority for this Caribbean island nation, where only 4.3 percent of the energy consumed comes from clean sources. The biodigesters, which are homemade in this case, will mushroom throughout Cuba over the next five years. The Swine Research Institute’s Biogas Promotion and Development Centre is designing a national plan to promote the use of biodigesters in state companies and agricultural cooperatives. In 2014, the Centre reported that there were 1,000 biodigesters in these two sectors, which benefited 4,000 people, in the case of the companies, and 8,000 people, in the case of the farming cooperatives. The plan projects the construction of some 1,000 biodigesters a year by 2020, through nine projects implemented by the Agriculture Ministry and the non-governmental National Association of Small Farmers, which will receive financing from the United Nations Small Grants Programme. According to Rita María García, director of the CCRD-C, monitoring of the project has shown that replacing the use of firewood, kerosene and petroleum-based products with biogas makes household work more humane. Women gain in safety and time – important in a country where unpaid domestic work absorbs 71 percent of the working hours of women, according to the only Time Use Survey published until now, carried out in 2002 by the National Office of Statistics and Information (ONEI). The study found that for every 100 hours of work by men, women worked 120, many of them multitasking – cooking, cleaning, washing and caring for children. The methodology followed by the CCRD-C projects first involves training for the beneficiaries in construction and maintenance of the biodigesters, and in ecological farming techniques using organic fertiliser, said Juan Carlos Rodríguez, the organisation’s general coordinator. The CCRD-C also promotes reforestation by small farmers and the use of windmills, to reduce the use of electricity in a country that imports 53 percent of the fuel it consumes. An additional benefit of the biodigesters is that they offer an alternative for the disposal of pig manure, which contaminates the environment. In 2013 there were 16.7 million pigs in Cuba, 65 percent of which were in private hands in this highly-centralised, socialist economy. Because pork is the most widely consumed meat in Cuba, and many private farmers and families raise pigs, the Ministry of Science, Technology and the Environment are fomenting the installation of biodigesters, to help boost production. The authorities require those who raise pigs to guarantee adequate disposal of their waste. Biogas is a mixture of methane and carbon dioxide produced by the bacterial decomposition of organic wastes. It can be used for cooking food, lighting, refrigeration and power generation. Biodigesters help reduce soil and groundwater pollution, and curb the cutting of trees for firewood. Cuba introduced their use in the 1980s, with U.N. support. But they began to take off a decade later, thanks to the National Biogas Movement. Studies reported by the local press say the annual national potential for biogas production is over 400 million cubic metres, which would generate 700 gigawatt-hours per year. That would reduce the release of carbon dioxide by more than three million tons, and would reduce oil imports by 190,000 tons a year.